My classic scenario: I don’t know about you, but as I get older, I find myself already not trusting my brain! What do I mean by this? I am so busy with a packed schedule, three kids and I can’t remember if I put my keys in my purse or left them upstairs… did I leave my cell phone plugged in at home or is it still in the car? Do I have to take the kids swimming this Saturday or is it the following? Then by the end of the day, you know it is best for your health to forget about the world, because really tomorrow can wait, but you feel overwhelmed and flustered knowing that you may forget something important that you have to do for the next day. Does this sum it up? Protecting my brain is one of my priorities for my health. I want to make sure I can stay on top of raising 3 kids, handling a family business and also just being able to think clearly. There are many supplements to take and it is hard to narrow in at times and choose. 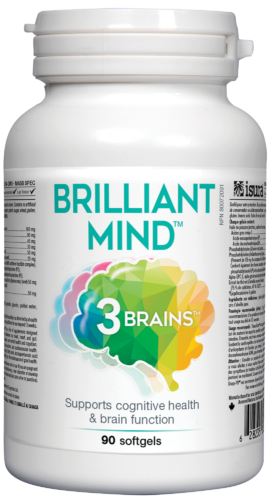 I wanted to bring some awareness around this amazing NEW product called, Brillian Mind 3 Brains. day for anyone of all ages. This is one of the best formulas I have seen for optimizing Brain health. It is no secret that these days in order to survive we need some extra help. Take advantage of our in store promotion and find a location near you to start the conversation regarding your brain health. In the mean time eat healthy and get some daily physical activity. For more information on this product see Page 7 of our flyer. Progressive Kids Multi-Vitamin: Focus and Stamina! TODAY October 2nd, is Customer Appreciation Day at Alive Health Centre and Morning Sun!